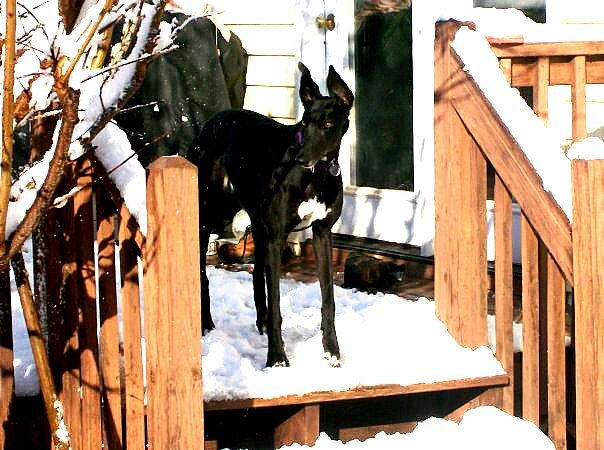 Something terrible happened to our treasurer, Sharrie Norton, this weekend; she lost her black greyhound Frosty in a horrible accident. Frosty was let outside in their fenced in yard and heard the fireworks going off in the distance and freaked out. Although the dogs were ushered inside as soon as the fireworks went off, Frosty had already left the yard. She jumped or climbed the five-foot fence and, after searching, Sharrie found her dead on the side of the road. Frosty had been hit by a car; she was five years old. What a horrible way for Sharrie and her family to start the new year. I am writing this, and I hope Sharrie doesn’t mind, because a “freaked-out” greyhound is just as bad as a missing greyhound. Greyhounds and fireworks are just something that don’t mix; most of them will do just as Frosty did and try to run. I am sending this out as a gentle reminder for all of you to remember that if there are fireworks in the area, please keep your grey inside. If they must go outside go with them. They frighten easily and lose their sense of what is right and wrong; they need us to remind them. This is just one of the things we don’t think about until we have to. I am just as guilty as everyone else in letting my greys out in a fenced in area – I just don’t think about it; I will from now on and hope you will too. Let’s honor Frosty’s memory by remembering just how frightened a grey can get and the extremes they will go to to get away from what frightens them. Godspeed Frosty – run like the wind on your new angel wings. Deb Martin is president and Sharrie Norton is treasurer of Electric City GPA in Anderson, South Carolina. We to have hounds, ( for the last 16 years) and we hate the idiots with the fireworks the first of the year, and the 4th of July. They need to be outlawed……..if you want fireworks, go to one of the big shows, dont put off in the neighborhood……..Were sorry for the lost of your wonderful greyhound. Thanks for sharing this tragic story, it’s a sad reminder of how attentive we must be. So very sorry for your loss, Sharrie–how devastating. Our thoughts are with you, your family, and sweet Frosty. Sad story… :-(. I try to pick up the water and turn everyone out early on such nights. Its unfortunately not always predictable.